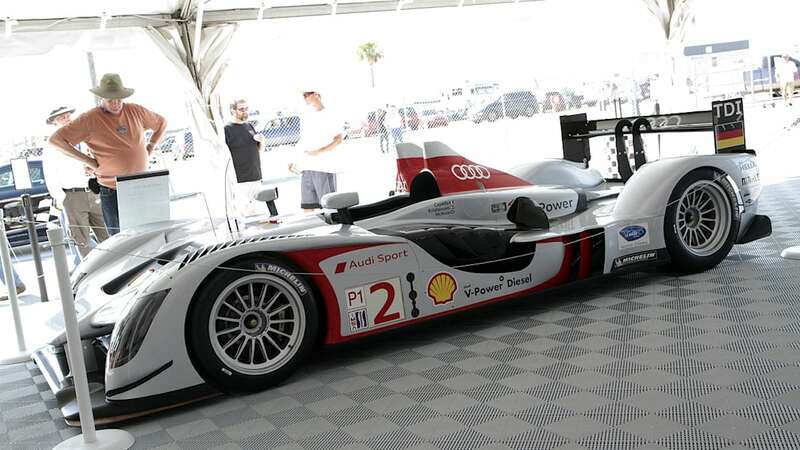 The 61st edition of The 12 Hours of Sebring is on, and Autoblog has come to central Florida with Audi to feast on jumbo boiled peanuts, pickled eggs and the final race for the LMP1 class at the oldest road course in North America. 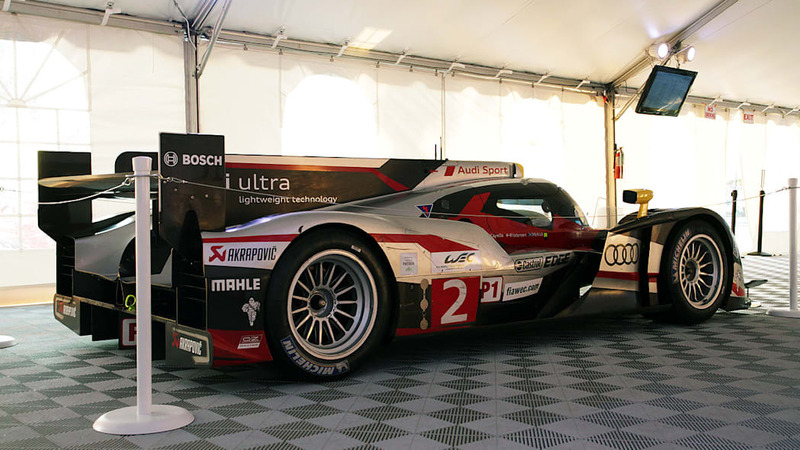 As Audi has been doing for more than a decade now, it's brought its latest endurance race car, the 2013-spec R18 etron quattro, to Sebring to begin testing for Le Mans. 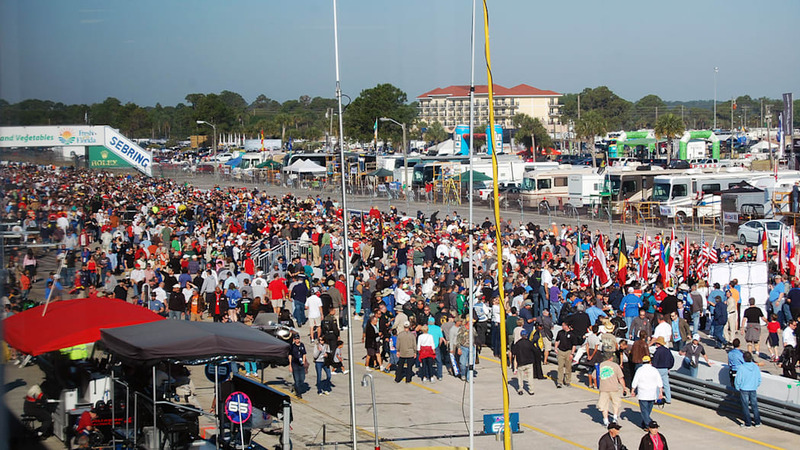 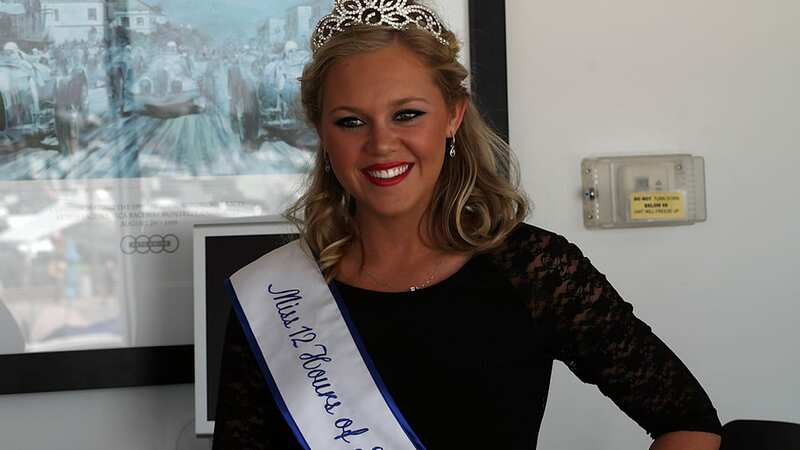 Why the commitment to Sebring? 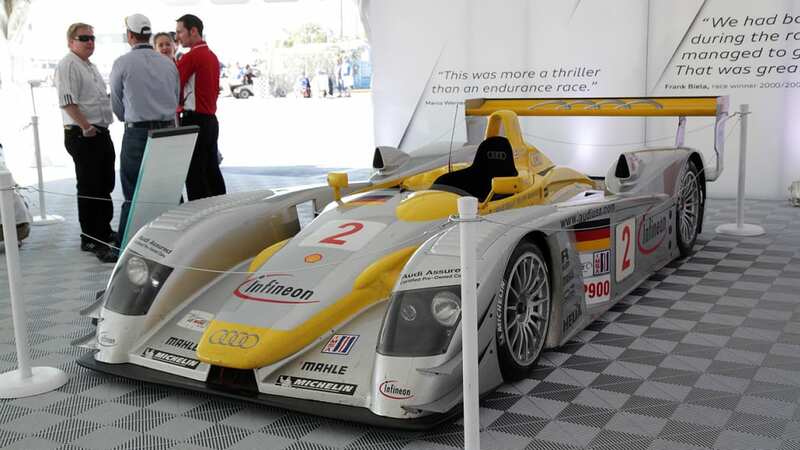 Audi Sport executives have repeatedly called Sebring "punishing," "extremely demanding" and "one of the toughest tracks in the world." 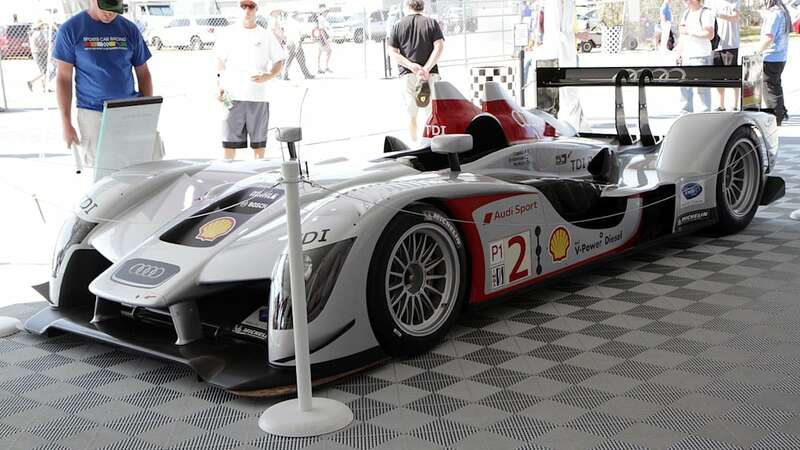 It is a 3.47-mile circuit that, in places, feels like it was made from the leftover bits of other circuits. 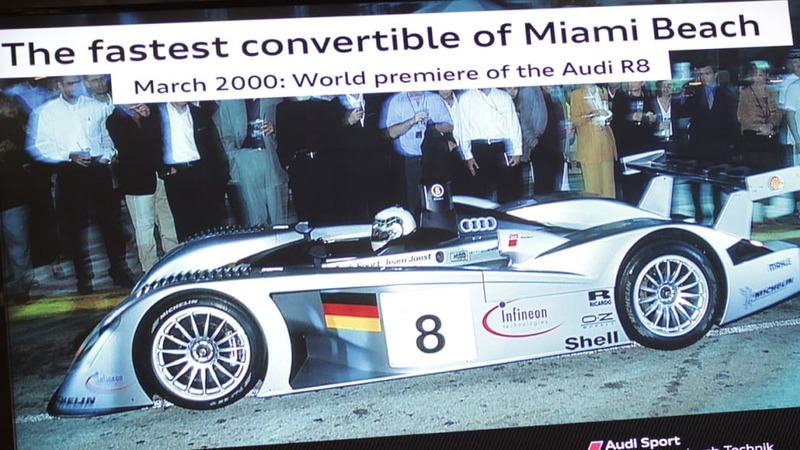 Doing the 12-hour distance in Florida is thought to be a good start on lasting the 24-hour distance in France, and we can't think it a coincidence that Audi has won ten times here in the last 13 years and 11 times in Gaul. 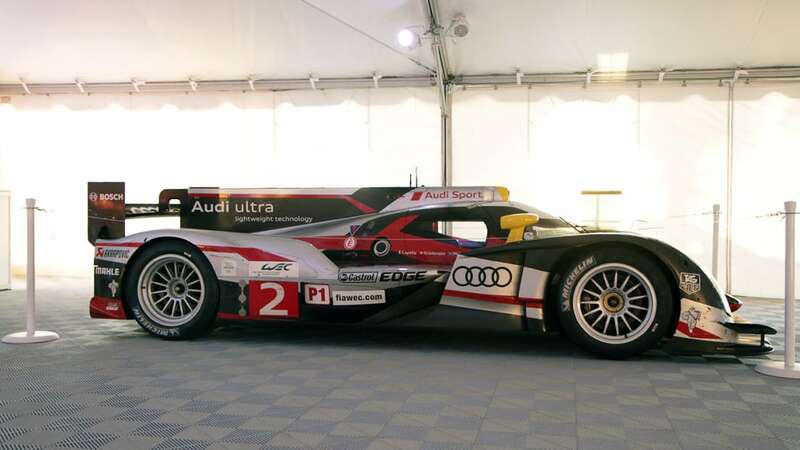 This is the first time that Audi's hybrid racer has laid rubber on American concrete, and this makes it a way to say both hello and goodbye to an LMP1 race car with Avenger-esque superpowers. 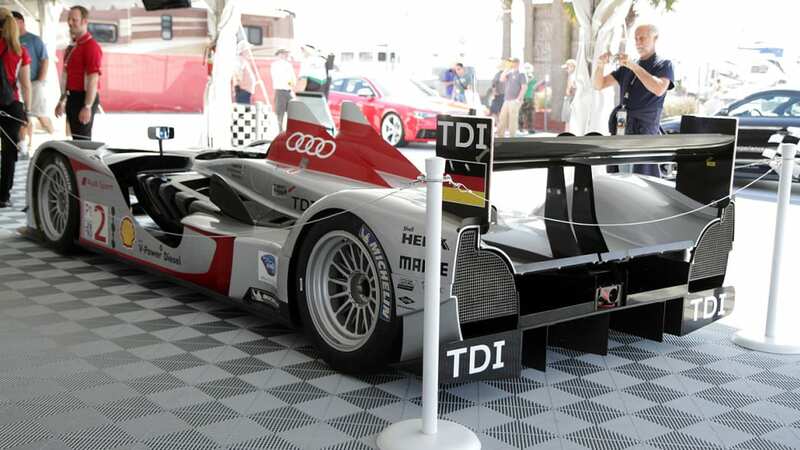 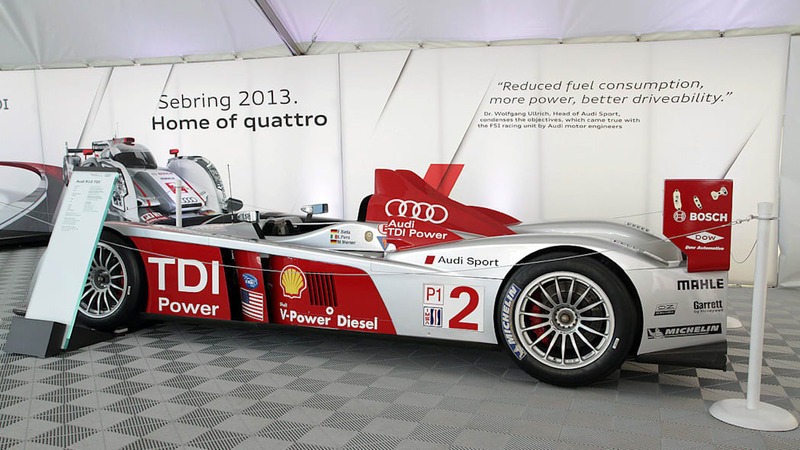 But to be fair to the other teams in the race, Audi bringing its 2013-spec R18 etron quattro to Sebring is like having the late, great Michael Jackson show up as a contestant on American Idol and do Thriller, complete with zombies and Norma Rae and the yellow contact lenses and that red zipper jacket, live. 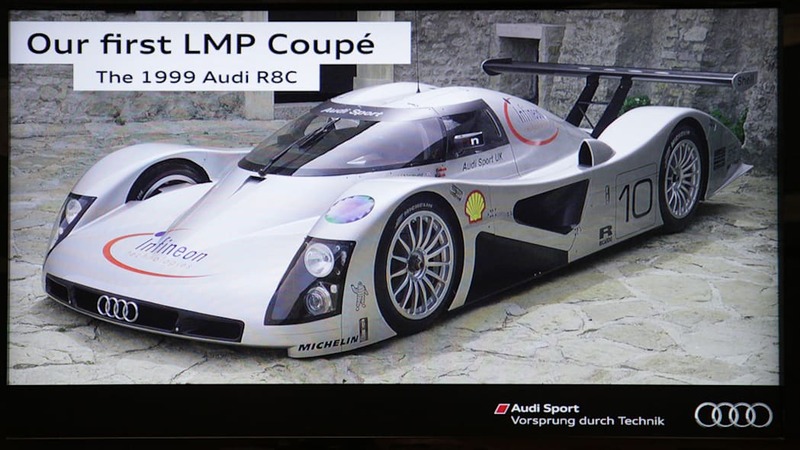 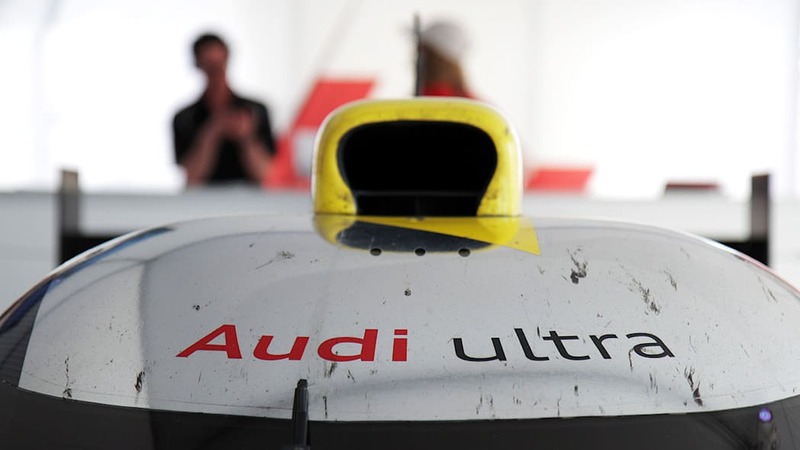 Audi's excellence and dominance – and budget – in a certain kind of endurance racing is prohibitive to the spirit of racing that relies on actual competition. 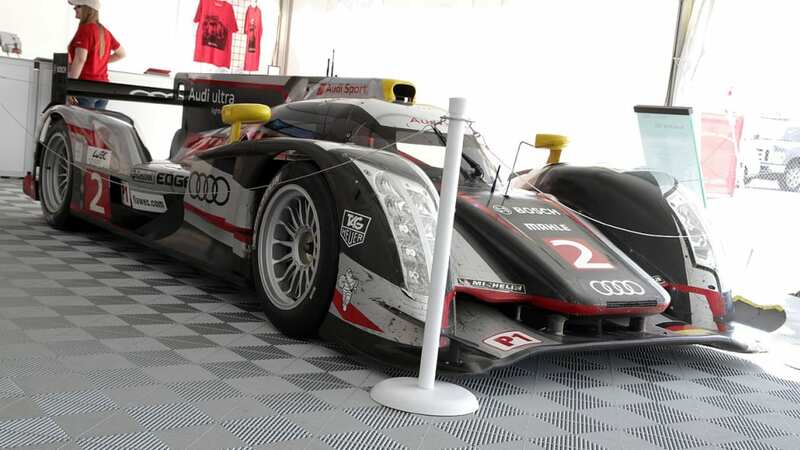 We say goodbye to cars like the R18 etron quattro because the merger of the American Le Mans Series (ALMS) and Grand-Am means the end of LMP1 entries – they won't meet any of next year's regulations. 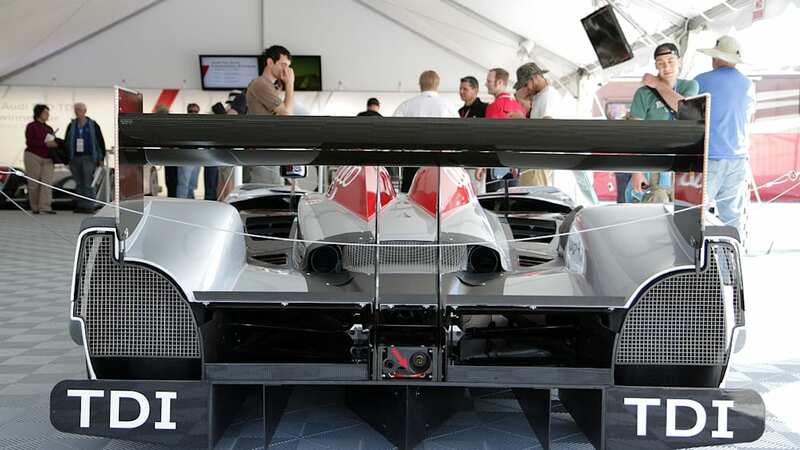 The various classes in the two series will be distilled into five classes under the single series: Prototype – the LMP2 cars in ALMS and Grand-Am's Daytona Prototypes plus the DeltaWing; the Prototype Challenge category from ALMS; two production-based GT classes, one of them being GTLM made up of ALMS GT cars, the other called GTD, which is the GT class from Daytona plus the GT Challenge class from ALMS; and the GX class that carries over from Grand-Am. 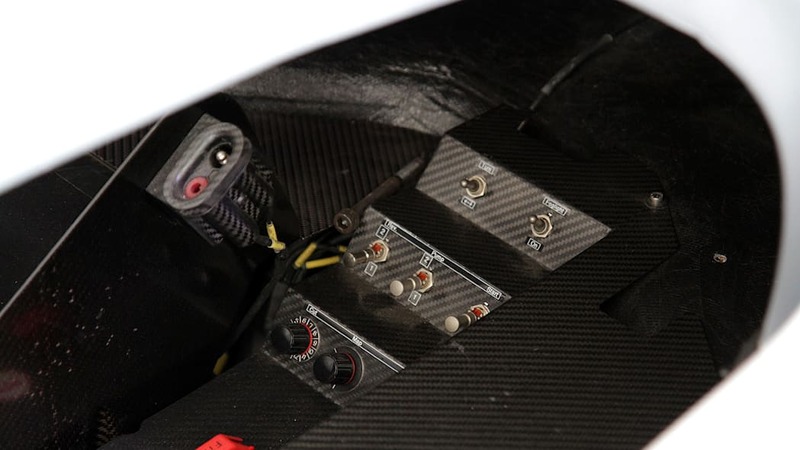 There are three antennas around the track that collect bursts of data from the car: one in the paddock, one in the pits, one at the end of the track. 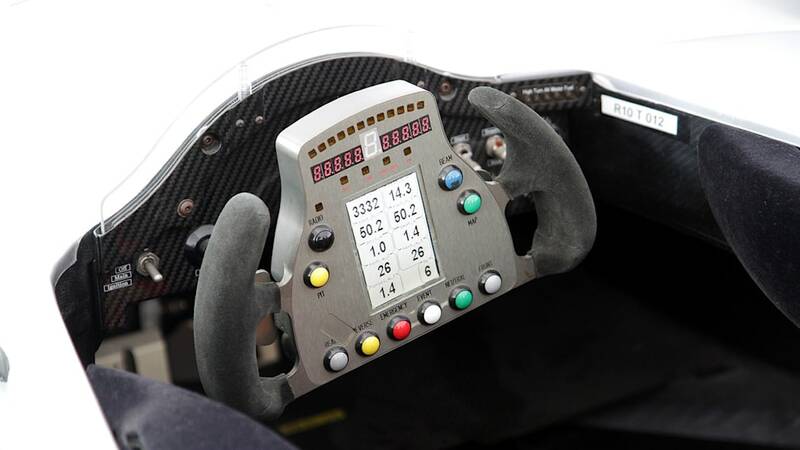 Those packets contain a great deal more information than telemetry alone can show. 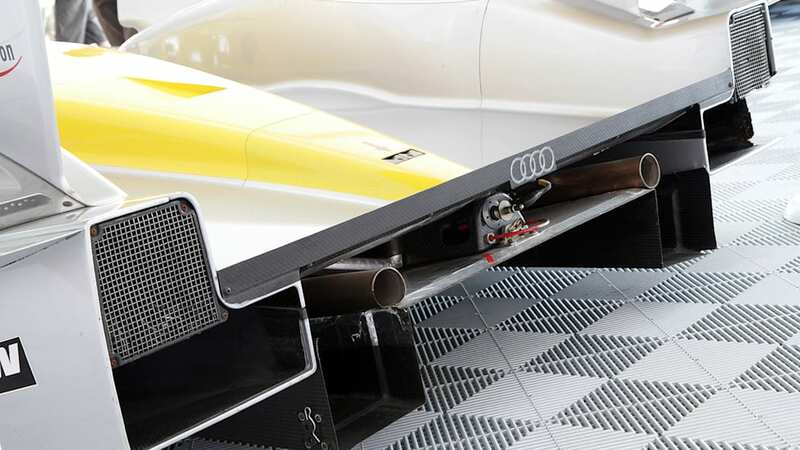 There's a load cell built into every one of the suspension arms, and the data burst will show if a control arm, for instance, that was rated for 700 pounds of force experienced an on-track jolt of 1,000 pounds, in which case the engineers would know to keep an eye on it. 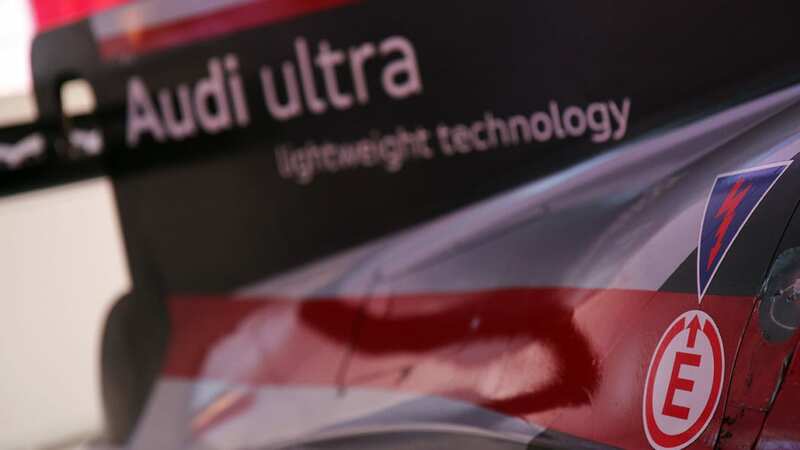 A compact flash card stores the data; if a data box fails, engineers can pull the card and its data, then put the card into a new data box. 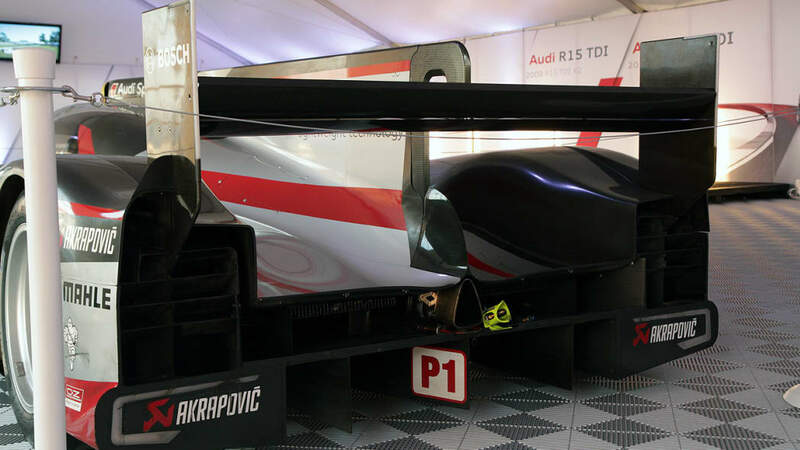 There are teams of engineers in the pit lane, another team in a trailer in the paddock and a third team in a tent in the paddock. 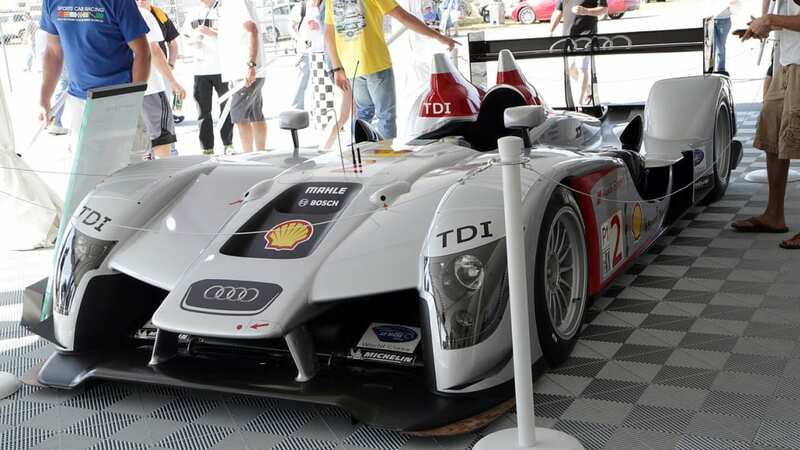 Audi brings roughly 100 people in total to take care of two cars. 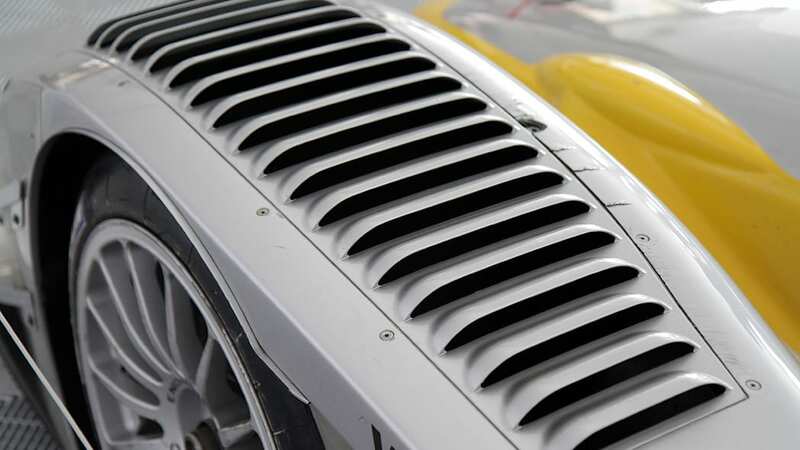 Before starting the car the oil and water in the engine are heated to the predetermined temperature; only when they've reached that temp can the engine be started. 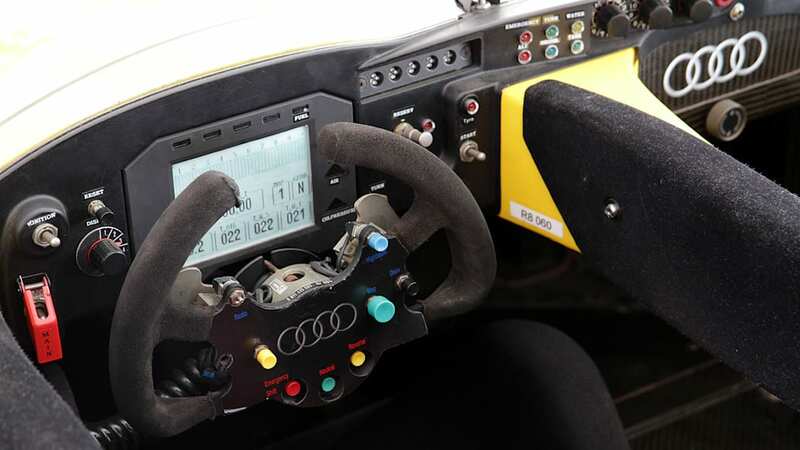 Every start is followed by a clutch diagnostic – the clutch is disengaged and re-engaged three times; while it sounds like Audi is warming up the car by revving it, it's actually a test to ensure the clutch is working properly. The return-to-paddock routine for the R18 etron quattro is run the exact same way every time: as the driver comes into the pits he runs through the steps needed to drain the 400,000 volts running through the hybrid system, green lights will illuminate on the dash when the system is completely drained. 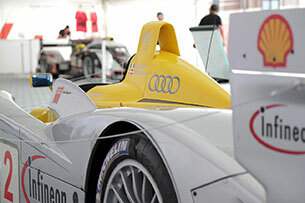 When the car pulls in to the paddock tent, each wheel comes to rest on a pad scale. 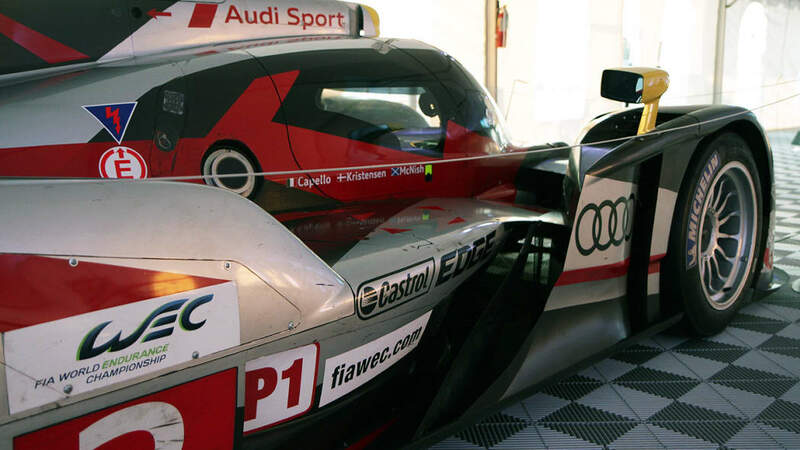 The car is washed, which gets it clean and serves as a damage inspection. 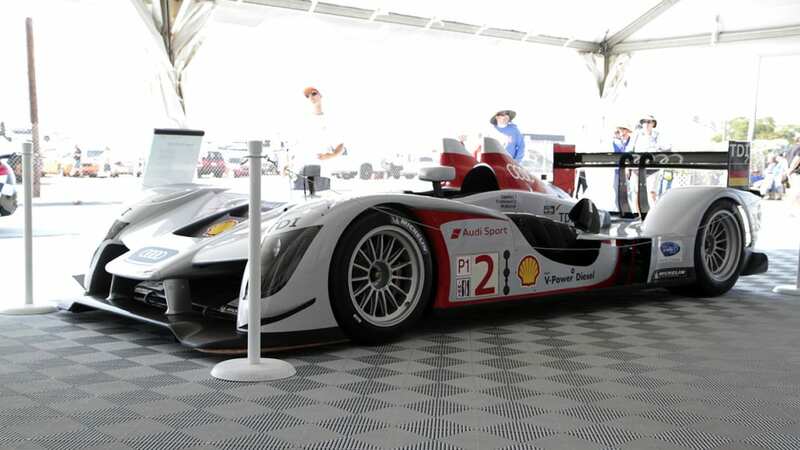 Mechanics drain the fuel cell, then they put 20 liters in. 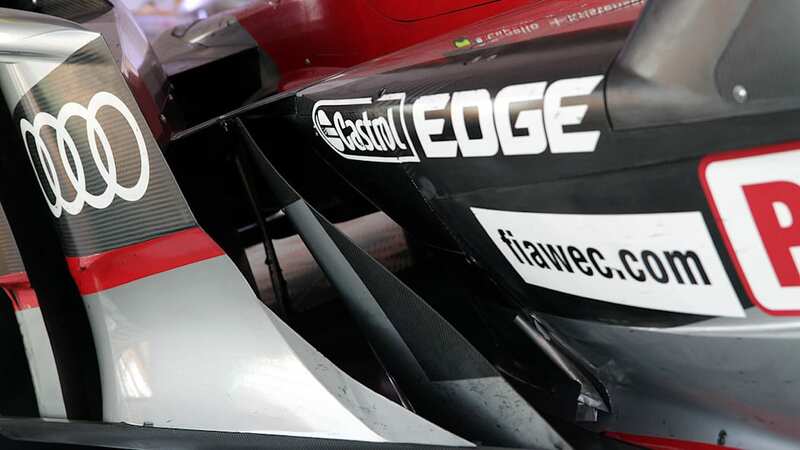 A clean car with 20 liters of fuel is the baseline, and at that point the team can compare the state of a car that has just returned to the track to its state when it last left the paddock – the new measurements are judged against those on the Mechanic Flat Patch Sheet to determine how far out of 'alignment' the car is. 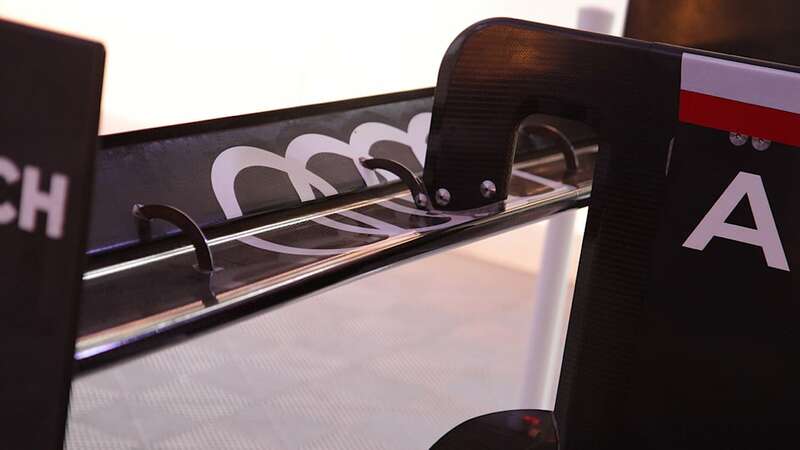 While mechanics dismantle the car to work on it they hang weights at the front and the back that match the weights of the completed car. 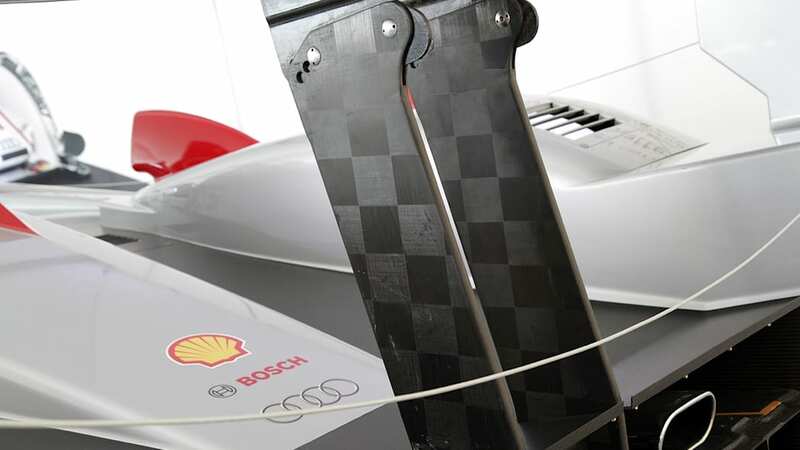 In front there is a single piece that equals the weight of the front cover, for the rear there is a 49-kilogram weight to replicate the tail section of the car and a 16-kg weight to replicate the weight of the engine cover. 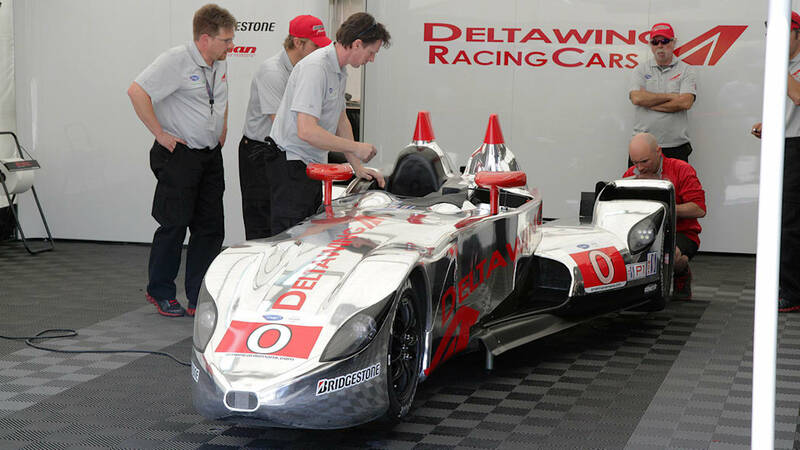 That way, the mechanics are always working on a car at its race weight. 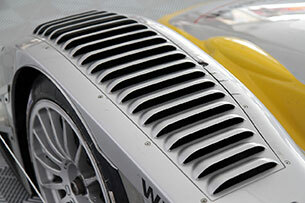 There are two sets of spares for each car and two color-coded toolboxes, each one containing tools dedicated to one car. 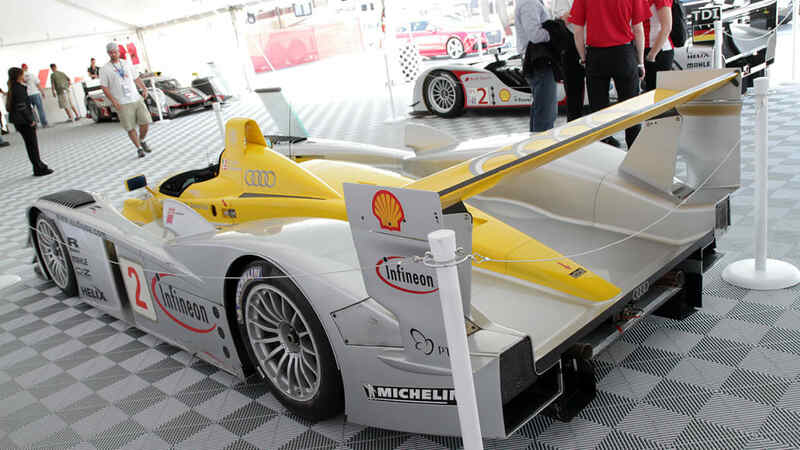 In one tool box all of the tools are affixed with blue tape, in the other all of the tools have yellow tape. 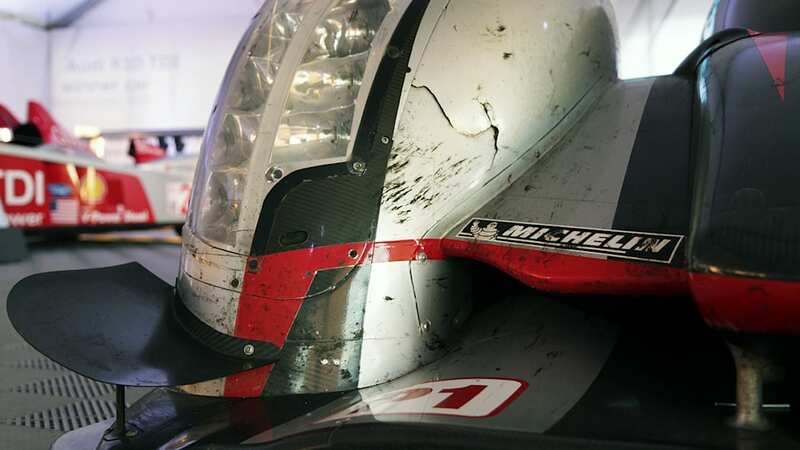 Most wrenches we saw were labeled with the car part they were meant to used on. 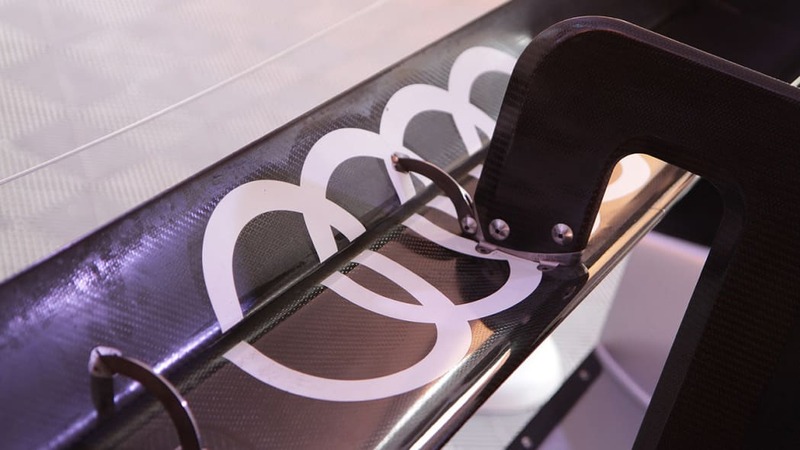 Every bolt is engraved with its part number. 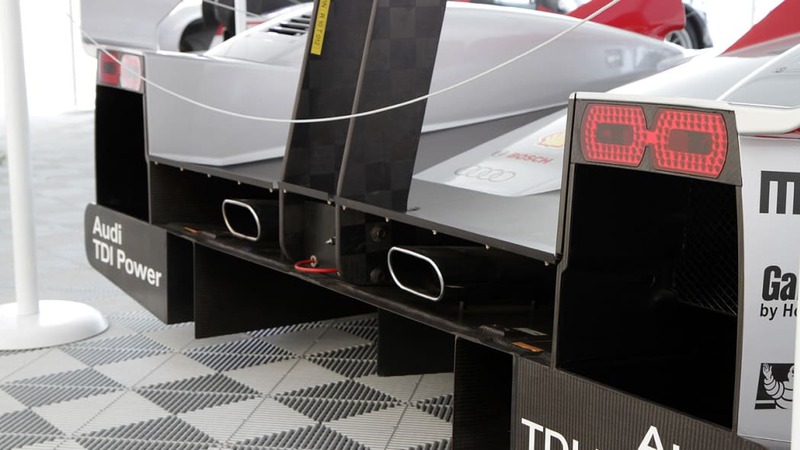 Another chest contained bins of tools, each bin containing all of the tools necessary to complete a particular repair job; if an oil pump or injector rails need replacing, a mechanic grabs the relevant bin and inside are all the standard and oddball tools needed to fix the issue. 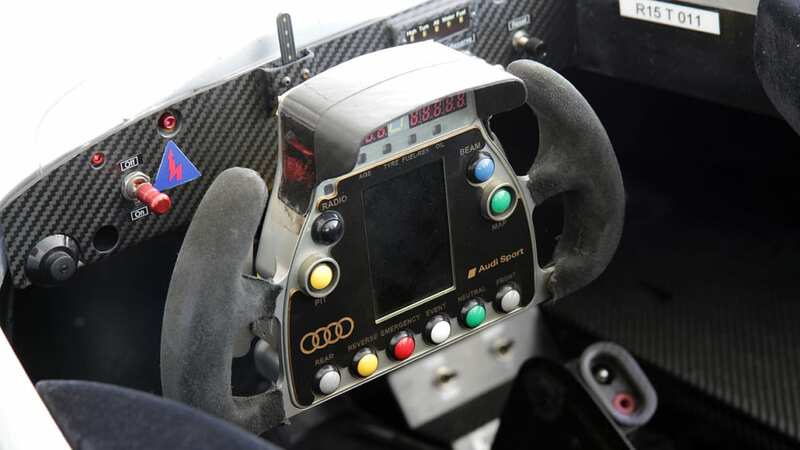 The one book to rule them all was a giant Haynes-like manual with exploded diagrams and part numbers corresponding to every item on the car. 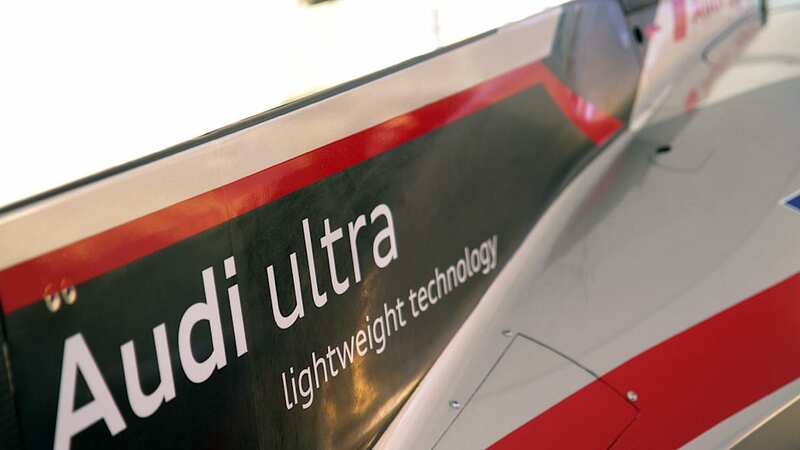 Entire corners of the car are prepared as a unit since it's easier to replace the whole rear section or the front left and right corners than a hub assembly or a suspension arm. 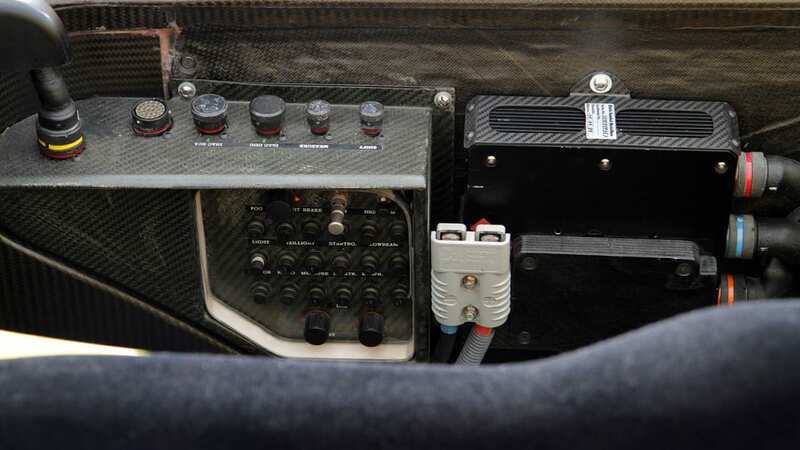 At the rear edge of the gearbox are cam locks; when the tail section is affixed, the cam locks get a quarter turn and that automatically fires up the electrical system and the air jacks. 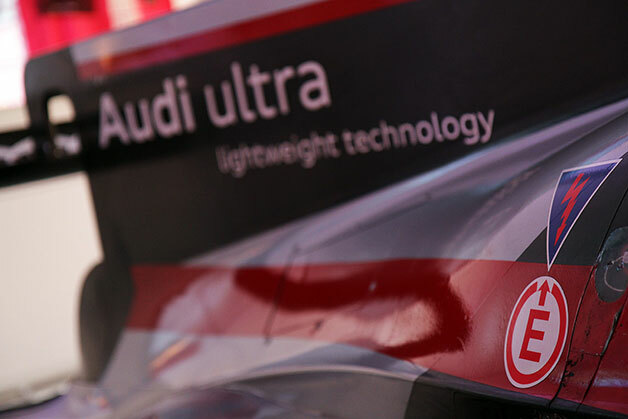 Audi tracks the mileage of each part of the car. 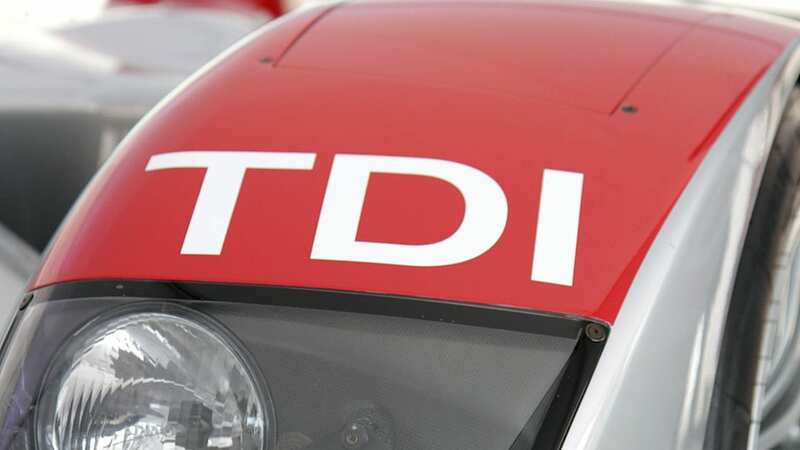 When a part has done 6,000 kilometers it is returned to the lab in Germany for inspection, and if it passes inspection it is returned to service. 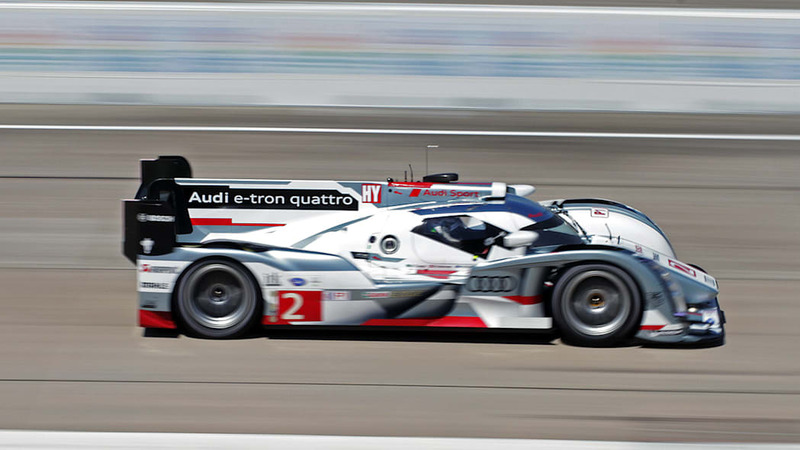 A part can do three cycles of 6,000 kilometers, then it is scrapped. 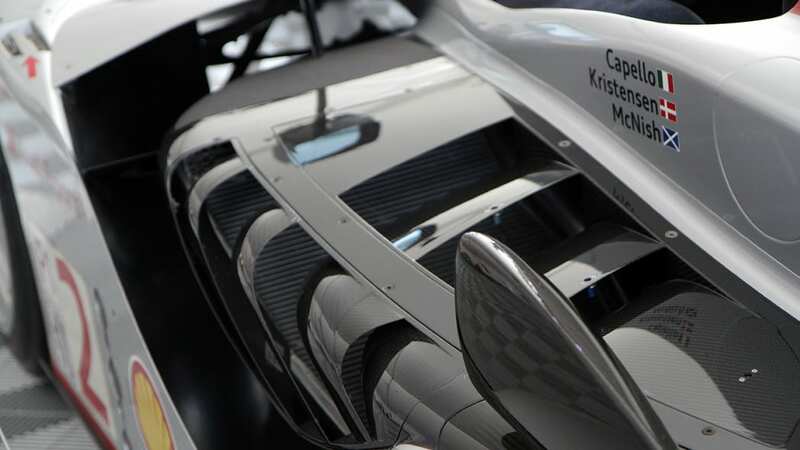 The carbon fiber brake rotors are sandwiched inside carbon fiber sleeves, and each spoke on the magnesium wheel rim is scalloped – according to wind-tunnel testing – to optimize the airflow for brake cooling. 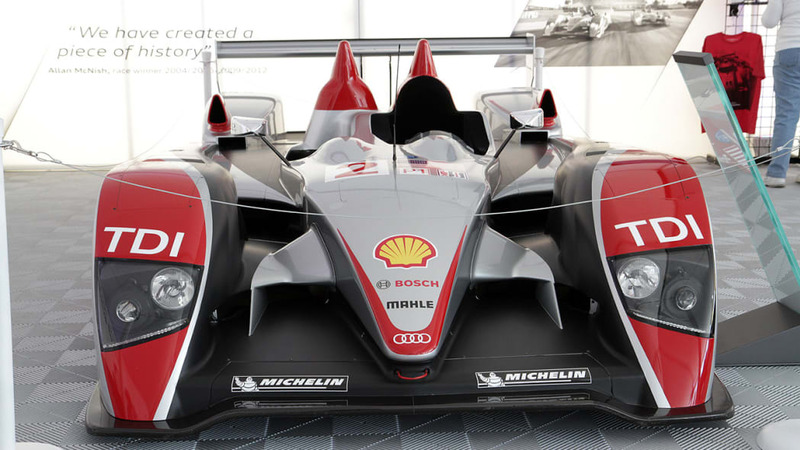 As with every team it supplies, Michelin has two engineers embedded with the Audi team, one for each car. 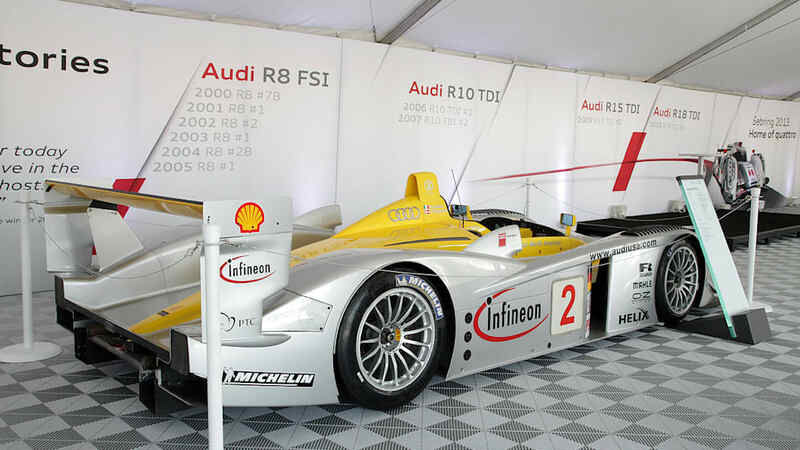 Michelin mounts the tires on the rims and then returns them to Audi, and as soon as Michelin drops them off Audi balances the wheels again. 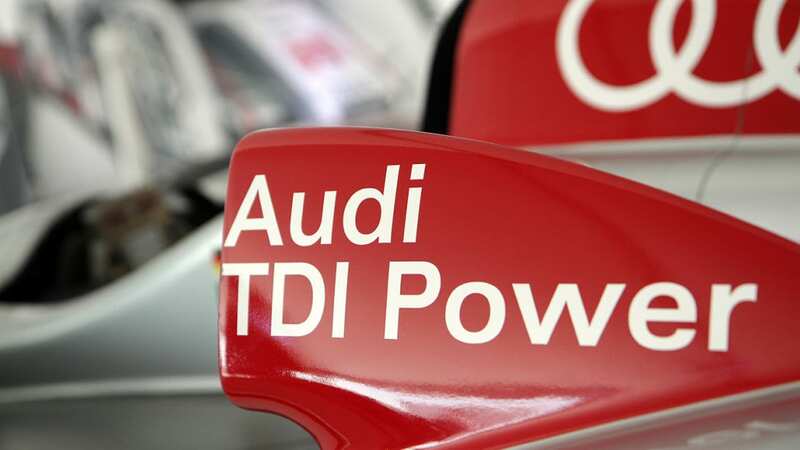 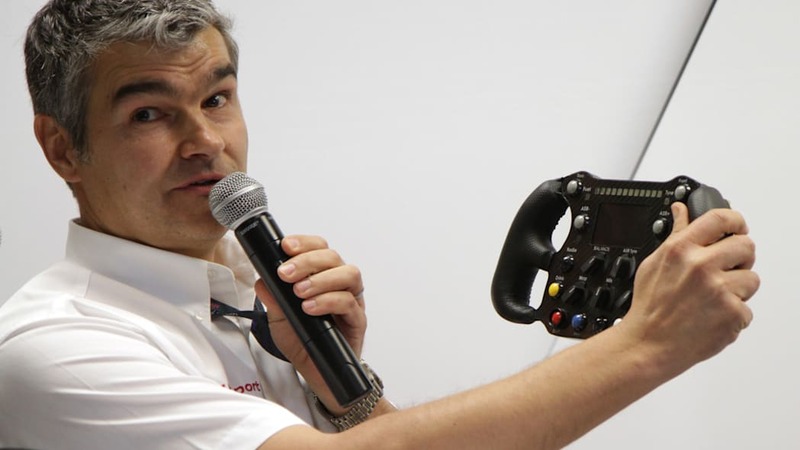 Audi uses a voice-activated walkie-talkie system in the pits so that team members don't need to remove a hand from the job they're doing to press a button. 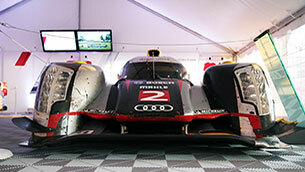 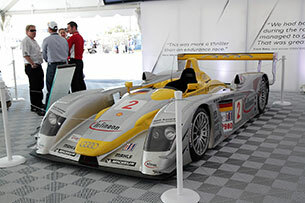 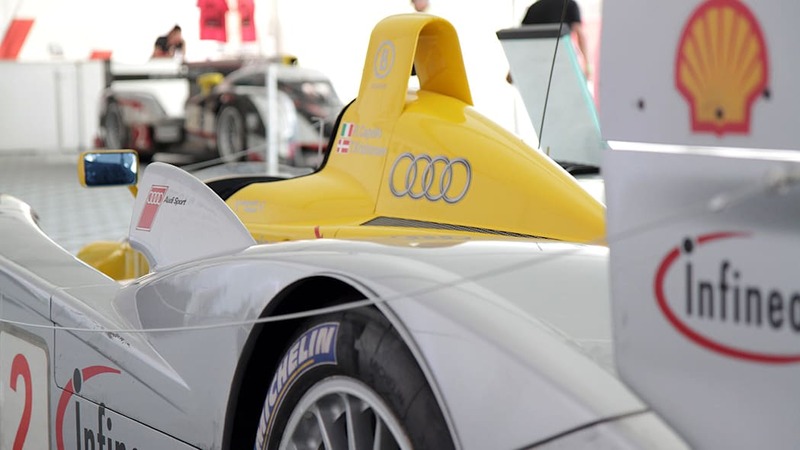 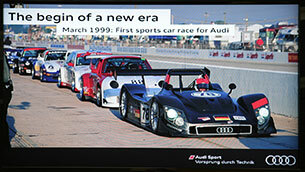 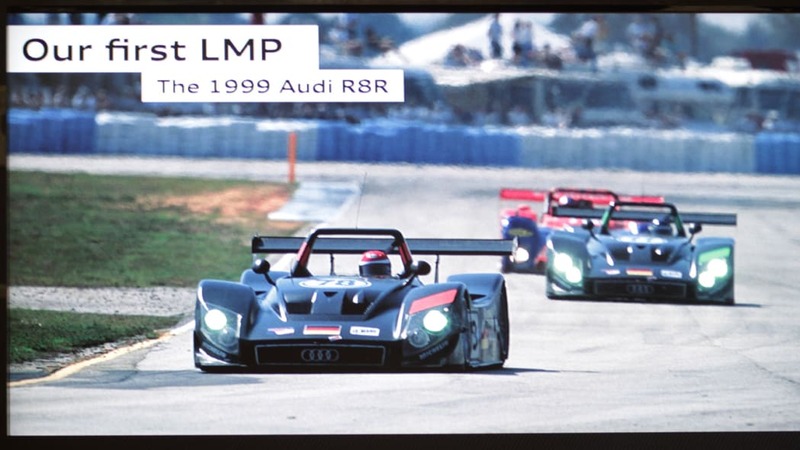 Audi won Sebring six consecutive times with the R8, from 2000 to 2005. 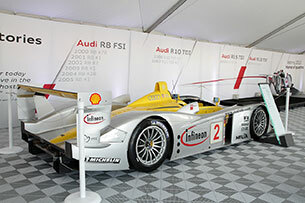 It won in 2006 and 2007 with the R10, in 2009 with the R15 and in 2012 with the R18 ultra. 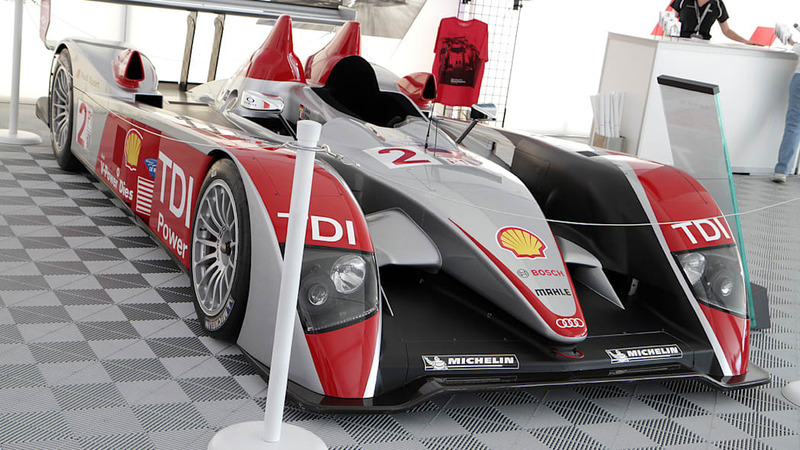 The R18 was the first closed-cockpit car Audi made since the R8 C in 1999. 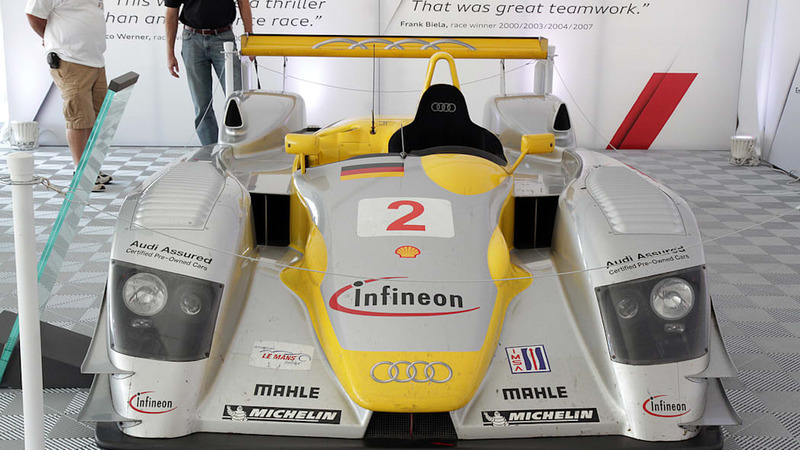 Audi developed two versions of the original R8 race car, one open and one closed, ultimately going with the open version. 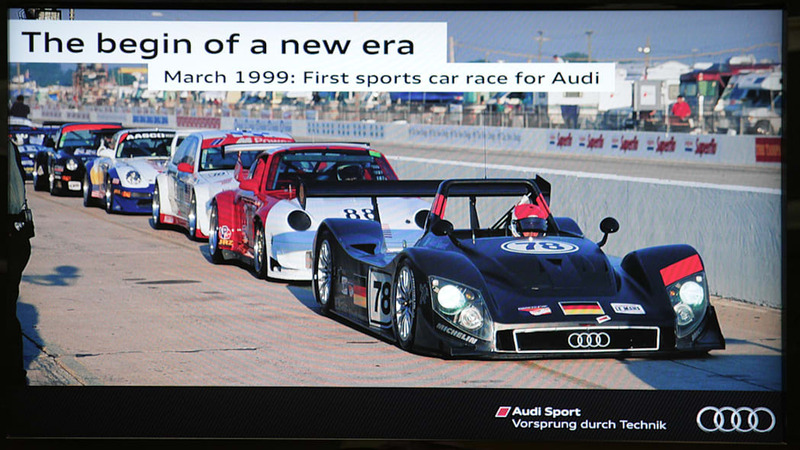 Dr. Wolfgang Ulrich, the head of Audi Sport with 10 Sebring wins and 11 Le Mans wins to his credit, was against the closed-cockpit car in the beginning. 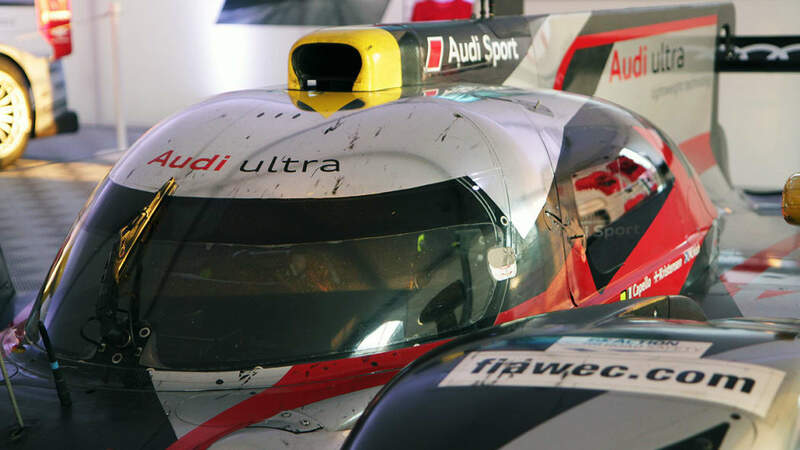 Back when the regulations allowed four men to change the tires during a pit stop, even when the closed-cockpit competition was faster on the track Audi was making up so much time in the pits it didn't make sense to switch. 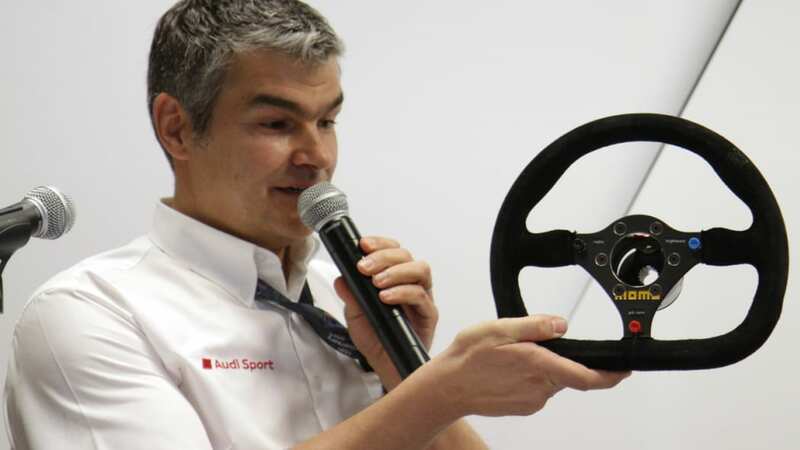 Then the governing body, the ACO, changed the regulations to allow only two men at a time to change a tire, and the time benefit was erased. 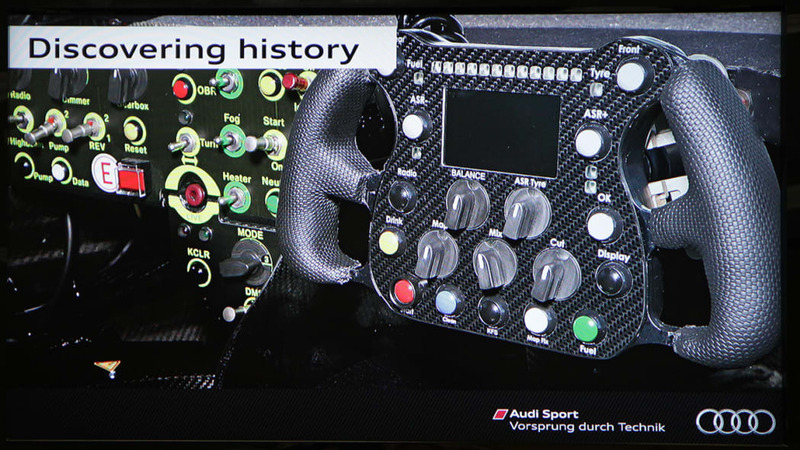 There were three buttons on the Momo steering wheel of the R8 C. The R18 etron quattro wheel has seven dials, 13 buttons and four paddles. 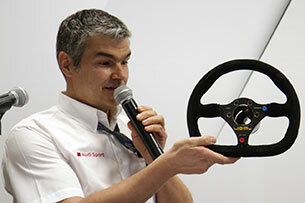 The upper left and right buttons are for brake balance; set to 53 percent in front and 47 percent in the rear as a base, it can be changed by one percent for every press of the Front or Rear button. 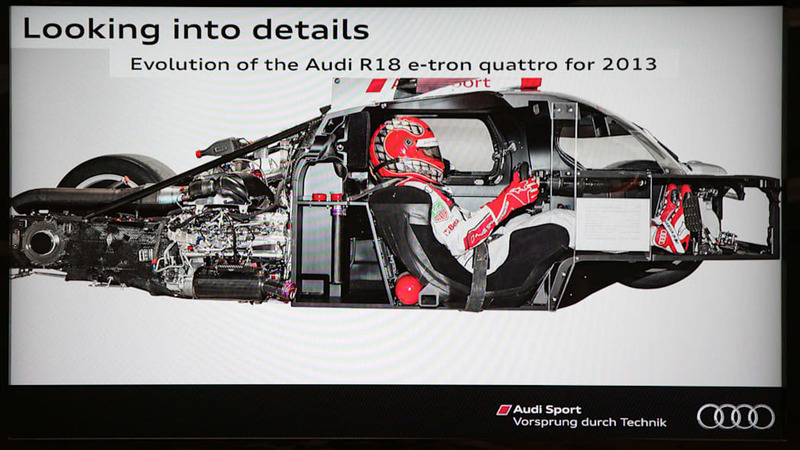 This is how the driver sits in the R18 etron quattro. 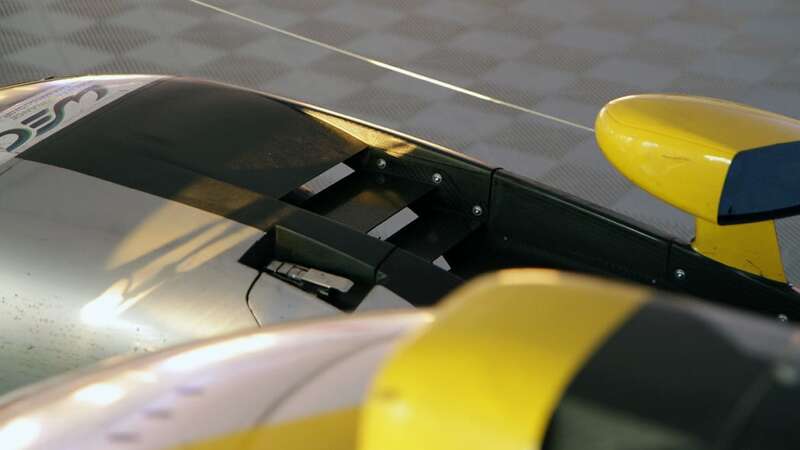 This year, to aid visibility because the driver sits so far back and doesn't have much head mobility, a wide-angle camera has been fitted to the roof of the car. 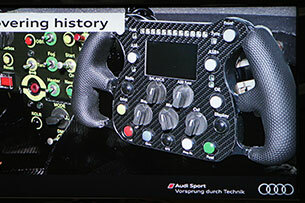 The display appears in a "rear-view" mirror in the cockpit. 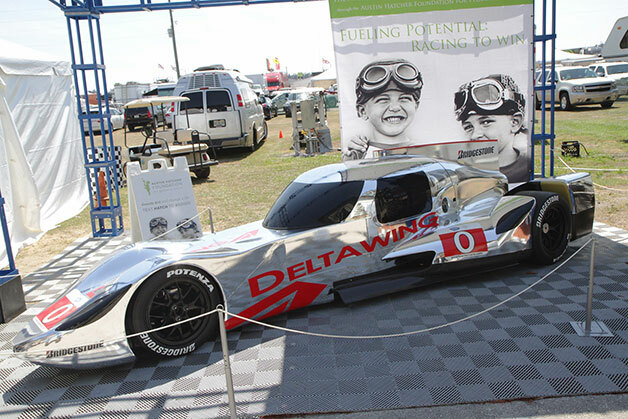 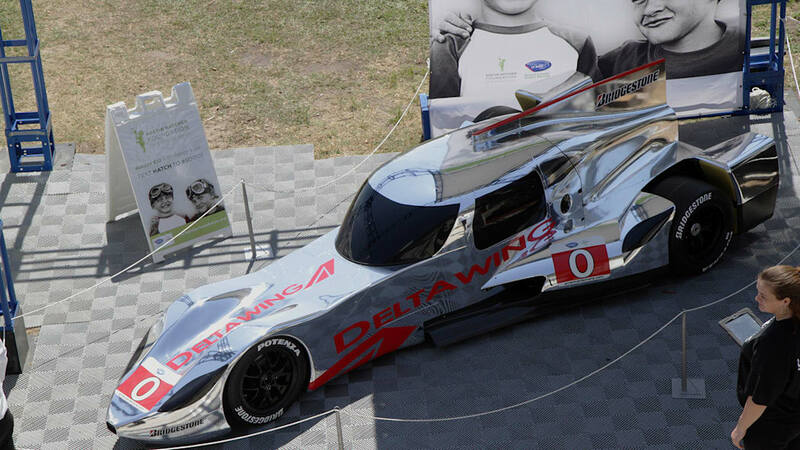 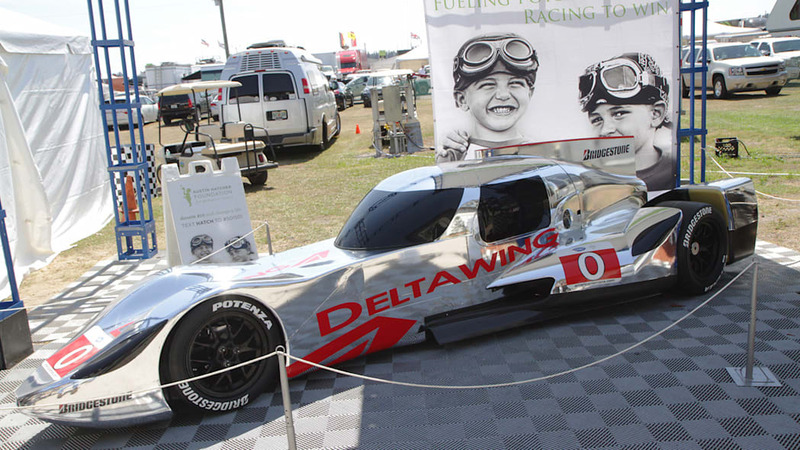 Spotted near the Audi hospitality suite: a mock-up of the DeltaWing Coupe that Don Panoz plans to bring to the customer racing market later this year. 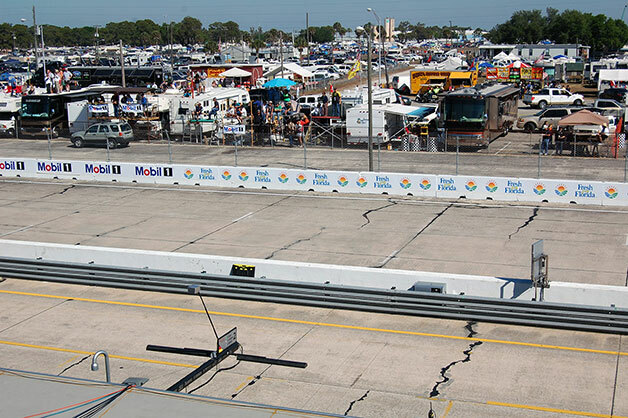 This is a section of the front straight at Sebring, just one of the wobbly sections along the 3.47-mile, 17-turn course. 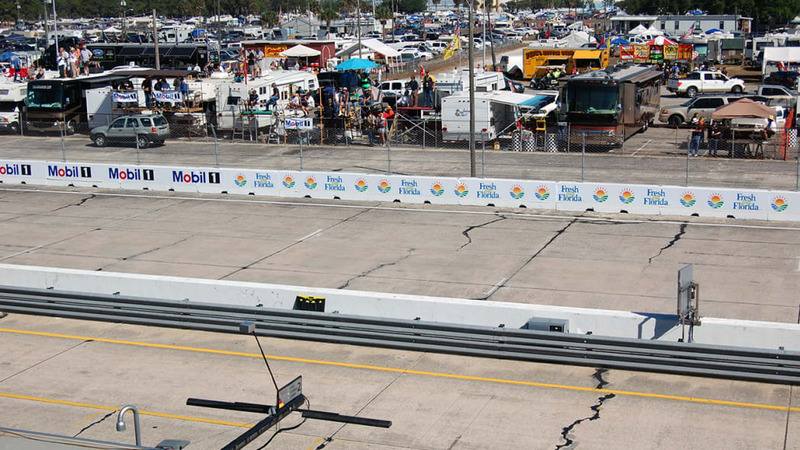 If it isn't the haphazard sealing job, it's the grooves, the sections that switch from concrete to asphalt or the mid-corner ripples that will get you. 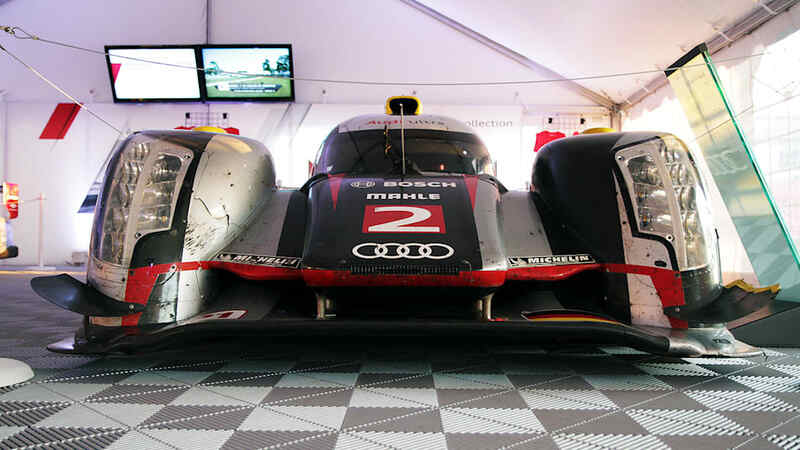 We drove two hot laps of it in an A8L, and even in a luxo-barge it felt like a bad road. 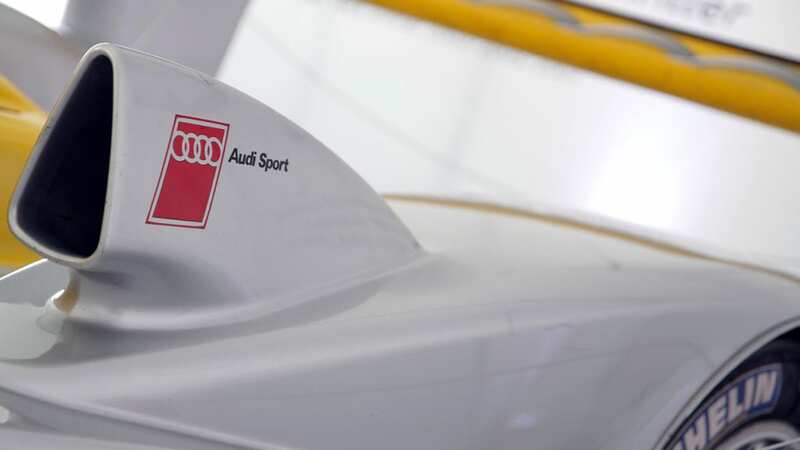 For 12 hours sitting atop a race suspension at average speeds of around 110 miles per hour, an "extremely demanding test of man and machine" is no joke. 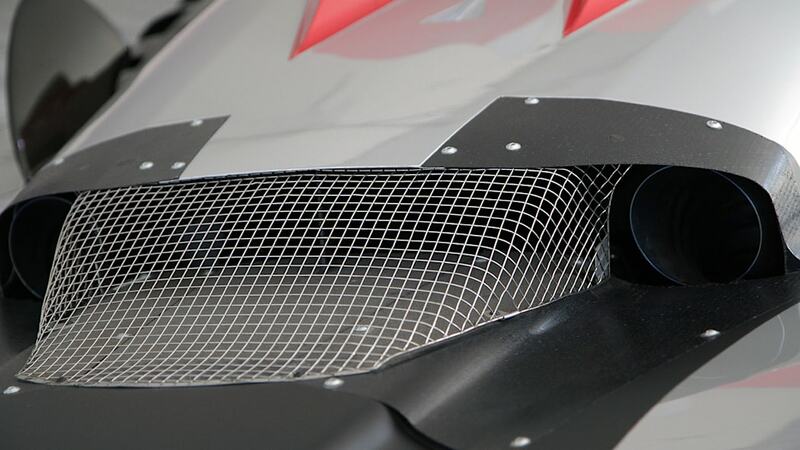 We'll be back tomorrow with the race recap.